If you want the best semi-automatic espresso machine, get the Breville Barista Express Espresso Machine. Semi-automatic espresso machines let you control the grind size and the espresso shot pull time. 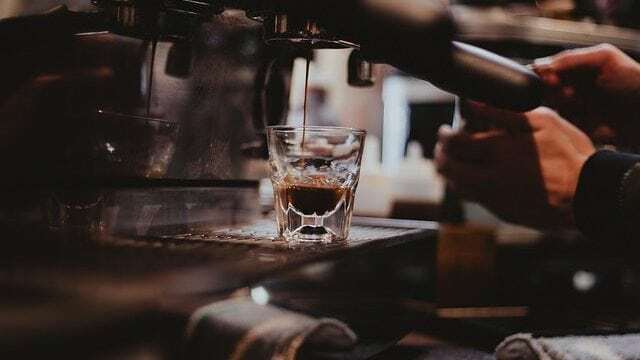 You have to grind and tamp your own coffee beans, but controlling these adjustments gives you the most control over the quality and taste of the espresso you pull. No brand makes semi-automatic espresso machines better than Breville, and the Breville Barista Express is the best of the best. Read our full Breville Barista Express review to learn more. 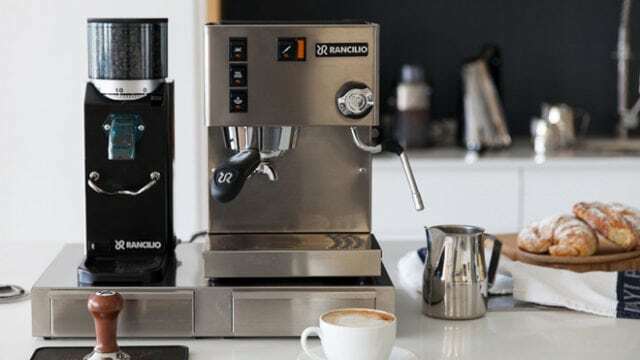 The Breville Barista Express is a semi-automatic espresso machine with automatic capabilities, so you get the best of both worlds in espresso machines. This semi-automatic espresso machine comes with a built-in grinder, dual wall filters and a 360-degree steam wand. 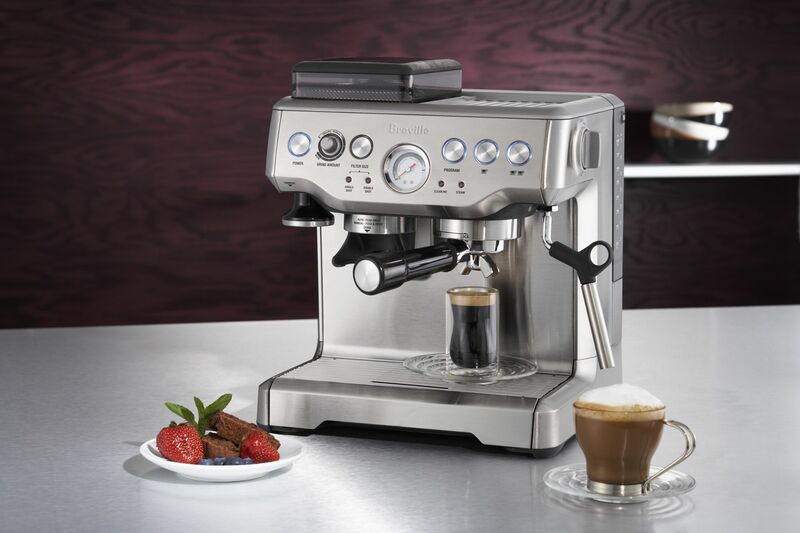 With the Breville Barista Express, you have everything you need to make all of your favorite espresso drinks. You can select the grind size and adjust the strength of your brew on the control panel. 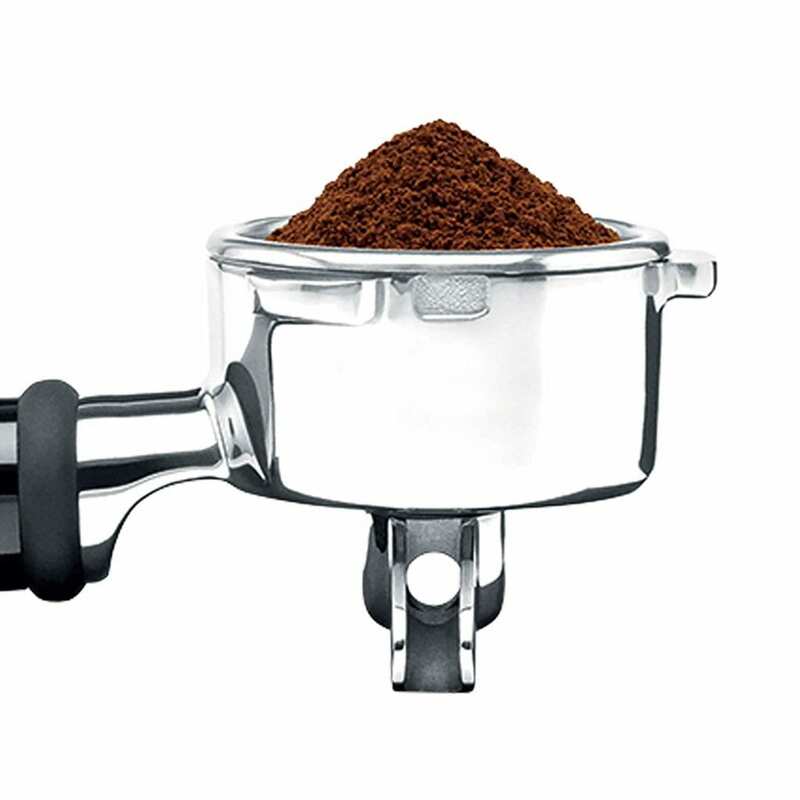 The integrated grinder then dispenses the perfect amount of coffee grounds into the filter for you. Breville is known to be one of the leading appliance manufacturers in the world. This espresso machine is made with high-quality stainless steel and smart extraction technology. The parts of this machine should last you a lifetime if you clean them the right way. Our Breville Barista Express review will go over pros, cons, features, warranty options and everything else you need to know if you’re interested in this machine. Adjustable grind size settings: You can choose from several grind settings ranging from fine to coarse. You can also choose how much of the grinds you want to go into the filter basket. 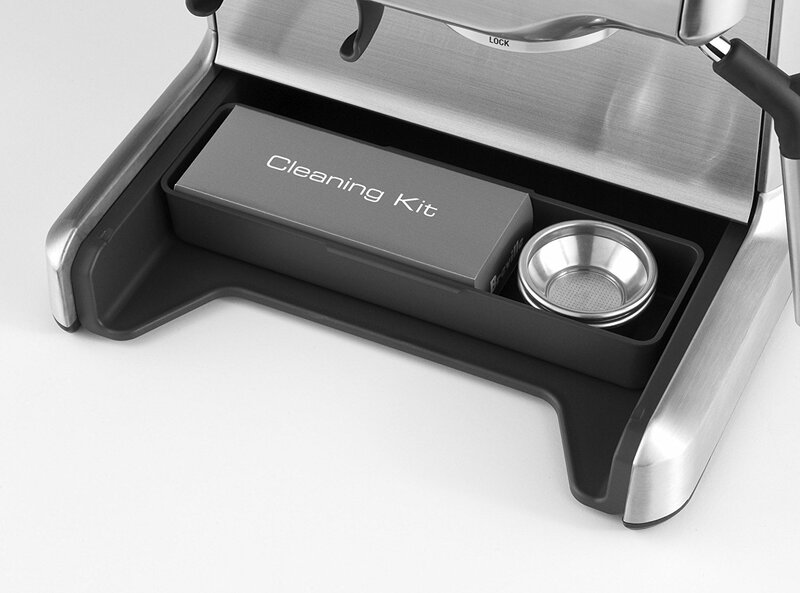 Cleaning notification light: You won’t have to worry about when to clean your machine or empty the drip tray. The machine will tell you. Hidden storage compartment: You don’t need to worry about forgetting where you put the tools you need to clean the machine with the helpful storage compartment. High-quality materials: This machine is built to last with high quality. Removable water tank with handle: This is a top-fill tank and includes a water filter. This helps you keep your water as clean and fresh as possible. This is something that many Breville Barista Express reviews mention as a particularly helpful feature. Thermo-coiling heater system: Even slight temperature changes can make a big difference in the flavor. The thermo-coiling system uses temperature control technology to minimize any fluctuation. This makes your espresso have the right temperature every time. High price tag: Most people don’t want to spend a huge amount of money on a home espresso machine. While the features make the product worth the cost, some people just don’t have the budget for this machine. Needs to be cleaned often: The cleaning lights are helpful, but you might not like how frequently they switch on. 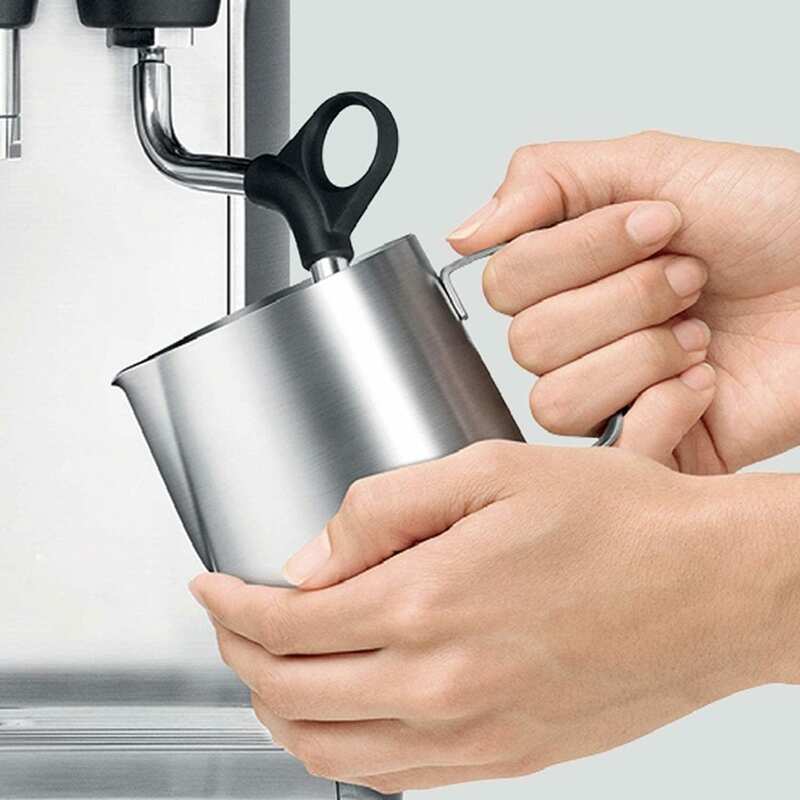 No super-automatic functions: If you’re looking for the option to make lattes and cappuccinos with just a button, you’ll want a super-automatic espresso machine instead. Product Dimensions: 13.2 in. x 12.5 in. x 15.8 in. 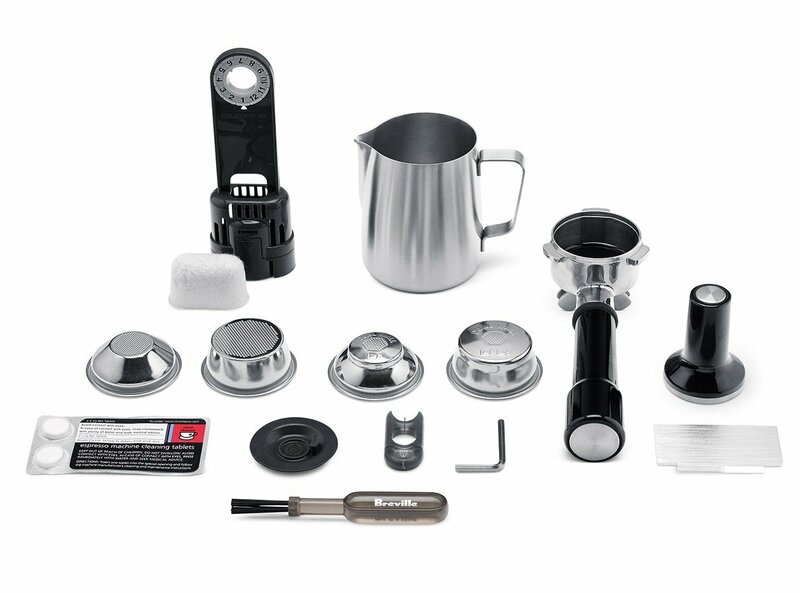 The Breville Barista Express comes with everything you need to pull the perfect shots and make the best espresso drinks. Even though it looks complex, this machine is great for beginners. Our Breville Barista Express review will go over the most important features in this section. Power, filter size and program settings are also on the control panel. Here you can control the grind size and select the strength of your brew. The integrated conical burr grinder will grind the perfect amount of beans for you and then dispense them directly into the portafilter. All you have to do next is tamp, swivel the portafilter back into the group head and press the button for either a single or double espresso shot. When you’re ready to clean your espresso machine, just pull out the handy cleaning kit that comes with it. This machine has the technology to help you make the perfect espresso every time. First, the digital temperature control keeps the water at the precise temperature you need and the machine delivers the water at exactly the right time. Two built-in wall filters add extra pressure to make up the difference if you grind the beans too coarsely or don’t tamp firmly enough. The pressure gauge is front and center on the control settings, so you can always make sure the internal pump is operating at the best pressure. 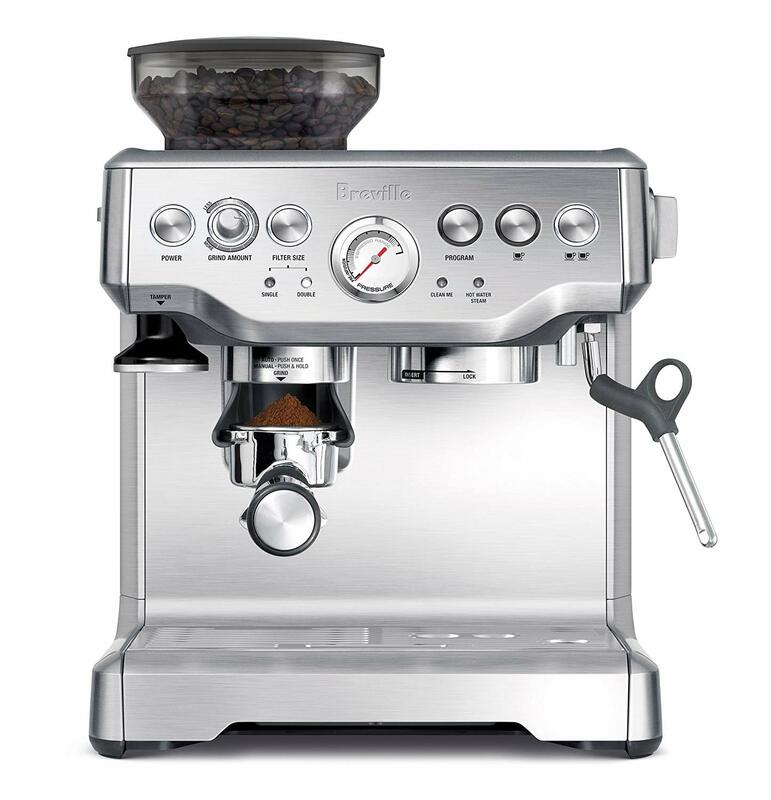 The Breville Barista Express comes with a free one-year manufacturer’s warranty valid from the day of purchase. Breville will arrange to have your broken espresso machine shipped back to them and deliver a working identical machine in its place free of charge. If you want more coverage after the first year, consider a longer warranty from one of these retailers. After our Breville Barista Express review, we think this is one of the best semi-automatic espresso machines you can buy. It’s best for anyone who already has knowledge about the art of brewing espresso or who wants to put in the time to learn. 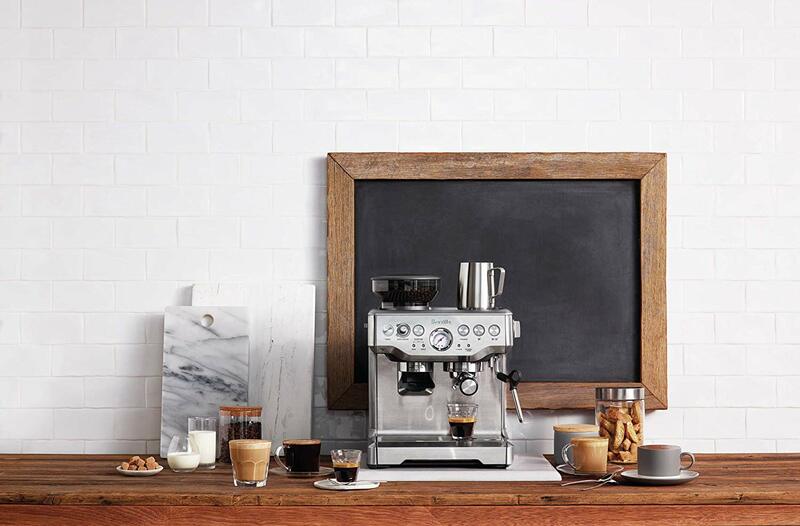 Breville espresso machines are built to last you a lifetime. 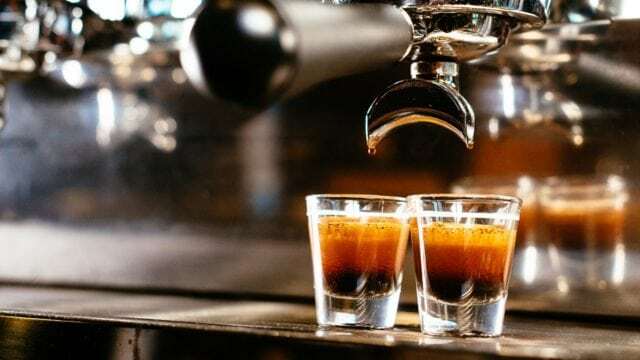 Spending upwards of $500 for a home espresso machine sounds like a lot of money, but the investment will quickly be worth it if you already spend $3/day buying coffee drinks from your favorite coffee shop. It’ll pay for itself in a little over a year. After our Breville Barista Express review, we think that the investment is worth it. Do you have this espresso maker? If so, leave your own Breville Barista Express review below!